As we enter the next exciting stage of our development and growth, we are seeking a Technical Lead for the Breathaboard product. 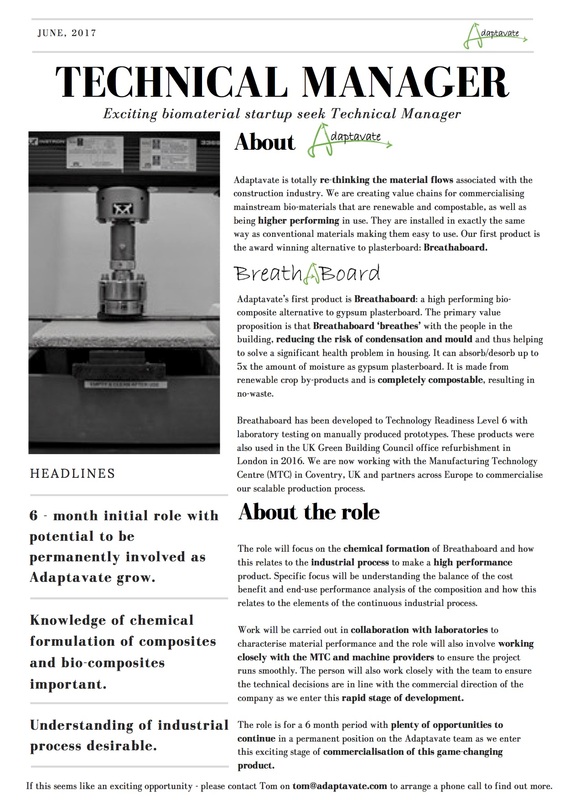 We are looking for someone to take responsibility of the formulation of the product and co-ordinate testing in relation to this, understand how this effects the industrial process and how it effects the end performance of the final product. It is a dynamic role with plenty of opportunities as Adaptavate commercialise this groundbreaking construction product. For more information, watch the video and job description below and if this is of interest to you or someone you know – we would love to hear from you! Please contact Tom on tom@adaptavate.com.